Rubenerd: I cite Wikipedia in everything I do! I cite Wikipedia in everything I do! 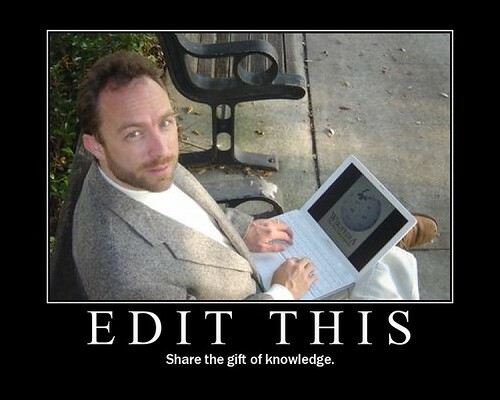 Ever since Wikipedia and its earlier incarnations started, there has been controversy in the academic community as to the reliability of its articles and whether or not it's appropriate to cite in assignments, much as every new medium throughout history has been questioned by those using the previous ones. Sure Wikipedia has its fair share of factual inaccuracies resulting from mistakes (and malice), but then again studies like this show that competing encyclopædic works aren't exactly gold standards themselves. The University of South Australia (where I study for half the year) has an official policy regarding Wikipedia that states if you cite it as a reference, marks will be deducted. ASIDE: I’ve been told this is not true, it is not de jure "official policy", though it is de facto. I'm not sure whether it's because socially I'm a quiet person so I feel as though I need other outlets to be rebellious, but because of this policy I include Wikipedia as a reference in every research assignment I do. With each citation I refer the reader to a page in the appendix corroborating each fact I gleaned from the Wikipedia page with further references to prove the authenticity of the facts and claims, along with an explanation. Could I just include the references I used to corroborate the Wikipedia page I cited instead of citing Wikipedia in the first place? Of course I could, but that's not the point. The point is to address what I see as the unfair negative bias the education community seems to have with user generated content. I figure for every hundred people who read my Wikipedia appendix explanations, perhaps one or two will take to heart what I've said and start taking it more seriously. I guess I'm still young and naive in that way, even though I'm not Bill Kurtis. Have I ever lost marks for doing this? Only once out of tens of assignments, and that one penalty was later rescinded on appeal. I reckon that's a pretty good record. LEGAL NOTICE: My electronic solicitor has advised me to disclose that I cannot and will not be held responsible for those who decide to follow my advice and fail an important assignment! By reading this message, you agree with this. Arigato, arigato gozaimasu.